SANTA ANA, Calif. -- The racing was incredibly intense and impressive as drivers from across the country threw everything they had at the track for the 17th Annual NMCA Muscle Car Mayhem, March 7-10 at Bradenton Motorsports Park in Florida. The first of six events on this year's highly anticipated NMCA tour featured side-by-side passes, personal bests and records made by racers dead set on driving to the Aerospace Components Winner's Circle. There were 19 drivers dedicated to making a 16-car field In VP Racing Fuels Xtreme Pro Mod, and Joe Baker blasted to a 3.72 in his Corvette to set the pace. Thirteen drivers behind him managed 3-second passes, but thundering to the final were Tom Blincoe and Jim Widener. After the pair of Corvettes leaped off the line with almost identical reaction times, Blincoe wheeled to the win with a 3.75, while Widener was forced to get out of the throttle. Mickey Thompson Street Outlaw saw 2018 NMCA Radial Wars champion James Lawrence lead qualifying with a 4.38 from his Mustang Cobra in its series debut. 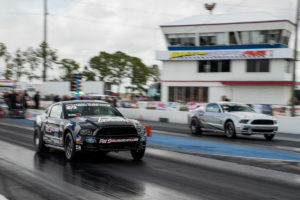 He remained on a roll through the final round, where he trapped a 4.44 and won a tight race against Shawn Pevlor, who was piloting Tony Bischoff's Mustang and trapped a 4.48. Showing up to shakedown in Holley EFI Factory Super Cars were 23 drivers in their Mustang Cobra Jets, COPO Camaros, and Challenger Drag Paks. Drew Skillman drove to a 7.70 in his Mustang Cobra Jet to lead qualifying, and incredibly 12 other drivers also posted 7s behind him. Adding to the excitement in qualifying, Chuck Watson Sr., Leonard Libersher, Scott Libersher and Carl Tasca Sr. also laid down 7s to join Geoff Turk in the Holley EFI 7-Second Club. Later in the weekend, Bill Skillman secured the win with a 7.82 in his Mustang Cobra Jet over Mark Pawuk, who was 8.01 in his Challenger. There were nitrous purges all around in ARP Nitrous Pro Street, where Jeff Ensslin drove to a 4.41 in his Camaro to lead qualifying, but on eliminations day, Tricia Musi met Mark Hoagland in the final. There, Musi, after being pushed back to the starting line after presumably losing reverse after a burnout, motored to the win and the Aerospace Components Winner's Circle with a 4.47 in her Firebird to Hoagland's 4.59 in his Camaro. In the ever-energetic Edelbrock Xtreme Street, Lou Iacopetti, who won the 2018 NMCA finals last year in Indy, landed a 4.65 to lead qualifying, but the final round featured father and son Troy Pirez Sr. and Troy Pirez Jr. and their Mustangs. Son secured the win over father after a close 4.71-to-4.74 fight. Naturally aspirated engines were singing in FST Carburetors NA 10.5, where Leonard Long led qualifying with a 7.84 in his Mustang. Later, he met John Langer and his just-rebuilt Trans Am in the final, and Long lapped up the win with a 7.89 to Langer's 7.97. In Chevrolet Performance Stock presented by Scoggin-Dickey Parts Center, reigning class champion Jesse Wilson wheeled to a 10.11 in his Camaro to lead qualifying, and he stayed strong through the final, where he lined up alongside Scott Brown and his Camaro. Wilson wrapped up another win with a 10.16 to Brown's 10.28, and took another trip to the Aerospace Components Winners Circle. Amy Faulk and her Firebird, which was 9.42 on a 10.75 index, were at the top of the list of qualified drivers in Coan Engineering Stock/Super Stock, but making it to the final were Ricky Pennington and George Cox. When the tree came down, Pennington was all over it and won with an off-the-throttle 11.62 on a 10.99 dial in his Mustang Cobra Jet, while Cox turned on the red light in his Camaro. Jim Netherland led qualifying with a 10.51 in his Skylark in Quick Fuel Technology Nostalgia Super Stock, but the final round belonged to Mike DeChicco and his Dodge and reigning class champion Kevin Gass and his Chevelle. Longtime racer DeChicco won with a breakout time of 9.44 on a 9.50 index when Gass turned on the red light. 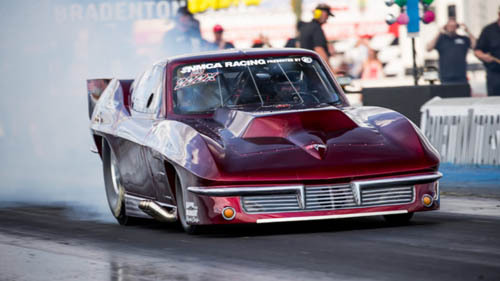 In Detroit Truetrac Nostalgia Muscle Car, where old school rules, Mike Clifford cruised to a 10.75 in his Barracuda to lead qualifying, but it was Chad Brewer and reigning class champion Andy Warren who were belting in for the final. There, Brewer earned the win with a 10.26 on a 10.25 index in his Nova, while Warren dipped under his 10.00 index with a 9.97 in his Caprice. Mike Roup recorded a perfect .000 reaction time in his Ranchero to lead qualifying in MagnaFuel Open Comp, and making it to the fifth and final round of competition were Cameron Bowles and Roup. In the double breakout bout, Bowles picked up the win with a 9.02 on a 9.03 in his Maverick while Roup was 11.16 on an 11.22. Cars capable of taking a 30-mile cruise and then making three back-to-back passes down track were in the spotlight for Gear Vendors True Street, and when it was all said and done, Yandro Ulloa was the overall winner with an 8.61 average in a Mustang Cobra and Mike French was the runner-up with an 8.71 average in a Camaro. Jason Rollins ran to the 9-second win in a Nova, Jeff Smith ran to the 10-second win in a Mustang and Sam Warmer ran to the 11-second win in a Mustang. Mike Baker earned the 12-second win in a Mustang, Wyatt Morse earned the 13-second win in a Ventura, AJ Mullen earned the 14-second win in a Mustang and Brittney Morris earned the 15-second win in a Charger. A special feature at all six events on the NMCA tour is the ever-growing Dodge // Mopar HEMI Shootout. At this event, Bill Lee Jr. was the overall winner with a 10.16 average in Steve Best's Dodge Demon, while Rusty Kloeber was the runner-up with a 10.37 average in a Hellcat. Gage Burch was the 11-second winner in a Challenger Red Eye, Diana Smith was the 12-second winner in a Challenger and Waiel Bayyat was the 13-second winner in a Charger. 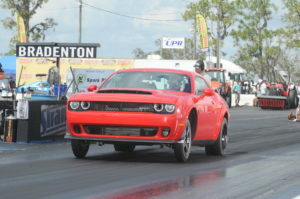 Scott Perry pushed to the 14-second win in a Charger and Gary Pritchett pushed to the 15-second win in a Challenger. The eight quickest drivers in the Dodge//Mopar HEMI Shootout came together for the heads-up Arrington Performance HEMI Quick 8 presented by Red Line Oil, and when the dust settled, Bill Lee Jr. made it back to back wins with a 10.26 in Steve Best's Dodge Demon, while Gage Burch turned on the red light in his Challenger Red Eye. In the Chevrolet Performance Street Car Challenge, Jeff Brady was the overall winner with a 10.12 average in a Camaro, while Tom Calabrese was the runner-up with an 11.81 average in a Camaro. Rendall Yoder picked up the 12-second win in a Corvette, Jerry Morse picked up the 13-second win in a Corvette and Ray Eugenio picked up the 14-second win in a Corvette. Two days of Fastest Street Car bracket racing were rolled into the event, and on Saturday, Paul Doorn defeated Allison Erlenbush in Bracket 1, while Trey Bunner defeated Troy Pirez Sr. in Bracket 2 and A.J. Mullen was victorious over Gage Burch in Bracket 3. On Sunday, Austin Logan won over Cory LeClair in Bracket 1, Gage Burch was the victor over Kyle Fawcett in Bracket 2 and Karley Holbrook ousted JC Cole in Bracket 3. Thankfully, there won't be much of a delay in action now as NMCA drivers will join forces with NMRA drivers for the next stop on the series' tour, the 11th Annual Scoggin Dickey Parts Center NMRA/NMCA All-Star Nationals Presented by MAHLE Motorsport, April 4-7 at Atlanta Dragway.